Ryan Cantor to the rescue: Chris Meyer how did Fullerton’s roads end up like this? Chris Meyer how did Fullerton’s roads end up like this? Decades in the city managers office and this is what we get for your obscene compensation plan of $186,000 a year in retirement income as our kids have to ride their bikes and skateboards around on this garbage and we have to spend a million dollars every 6 years on new police cars because the roads are ruining them. We want answers. Well, Joe certainly has a very valid point about the roads! They are the worst in the county! What gives????? Ha, Joe, the fact is, my issue is with you, not the so-called facts. The fact is that you’re the rudest individual I know. Your lack of civility at City Council only shows the try persin you are. I really don’t need to say anything more, except you haven’t figured out that your tactics dont work. When you open up your mouth, the majority of is fine out. Now Yo Uve managed to find another avenue to spew your ugliness and slander. So now you can add me to your critical talk because I’ve finally addressed what Uve been wanting to say for years. I have always been the mind that I can respect other’s opinions, even when I don’t agree, if they’re respectful. You, Joe, are on the other end of the spectrum. Now there will be some that disagree with me and others that will applaud, as . I don’t have an agenda like you do. I don’t want to run for City Council or any other seat. This is a one time response, as I will not continue to engage or address your blather. You like to goat people in and try to break them down. I won’t take the bait. I’ve said my peace. Have at it. You don’t care about the facts as anyone can review your comments at council meetings and arrive at the same conclusions. Great response and keep your steadfast and unwaivering support coming for the people that have and continue to attempt to destroy this community by turning Fullerton into an Agenda 21 high rise hell hole like LA. It makes my work easier. The net effect of the object of your derision and all the aforementioned and the efforts of the rudest, meanest, ugliest person you ever knew, yours truly and others, was the undoing of at least 25,000 high density apartments that would have been under construction right now as we speak. Yup the entire city would have looked like cell block H next to Coscto and worse. Instead I get to grocey shopping by my house at a nice grocery store that you and your establishment cronies wanted to bulldoze and jam 4000 units on. You keep doing what you are doing and so will I. The heat is getting turned up and people are going to start going to jail for what they have done to this place. We are going to find out what happened to all the money that should have went to fixing all the roads, and the cops are finally going to face the music they have played for us. The light of day is on Fullerton for good. The word is out on the streets that the developers are not welcome here and they want no part of Fullerton, The FPD is getting a much deserved enema and the residents are awake now. I will never be ok accepting the criminal behavior by the police, and the backdoor deals designed to rezone half the city into towering stack and pack apartments that have been thwarted for now. My job is easier than ever because the DA has the FPD’s number and all these shopping centers are now off the table for the wrecking ball. The investors won’t touch this town now and people will get to drive their cars and park them and walk into the strip mall stores and grocery stores that are being re opened for the first time in years. Just like the one by your house. Our styles are definitely different. You try the fear and intimidation approach. Not what I want or look for in a leader. Yes, I couldn’t resist one more comment…your’e right. The deal is we shouldn’t need a stupid grant to get our roads repaired properly and maintained. So we succumb to stupid roundabouts so the city could get one street paved. Where are the millions of dollars we pay in taxes to this city for infrastructure maintenance? We need to start asking this council serious questions on where all the money is going?? Upon review, there is one more resp9nse needed, since Imbriano professes that he speaks the truth. I never supported “4,000 units where our grocery store is going in”. This is a perfect example of how so much if what you say cannot be believed. You’re they’re with your camera all if the time, and meetings are available for viewing…where Joe did so ever support high density for that sight. I couldn’t let that go. Yiu made an “assumption” and it’s false. This is why I’ve finally had the courage to openly refute you. Well, we’ve come full circle now, we’ve got the children, the cats that might not have been run over if their owner cared enough to keep them inside, and Joe tying it all up with a nice little bow of city corruption and mismanagement of funds! For the record, I do in fact have kids, my son walks to and from school as well as rides his bike on Wilshire to and from friends houses all the time, and roundabouts or otherwise there are zero parents letting their kids play in the street on Wilshire. I don’t like the roundabouts because I’ve personally witnessed 5 accidents at the one 75 feet from my front door as well as seeing multiple near misses, my wife had someone run straight through the stop at Berkeley yesterday and almost t bone her even though she had the right of way, and it’s completely illogical to screw up the entire street so a hundred bikes a day can ride through without stopping at stop signs, things should be done that suit the majority of people using the street on a regular basis, not a tiny entitled minority going 10-15 miles per hour slower than the speed limit. I’m curious to see what they look like when they’re all done. they would create a little charm to the neighborhood, I really like them in many ways , and of course the lack of courtesy in the way people drive ,I can see this could be an accident waiting to happen on a regular basis ,I guess we’ll see. Joe, are you alleging that money was stolen (embezzled?) or do you just not like how the money was spent? Doesn’t the city have auditors who would notice millions of missing dollars? Are you are saying money was stolen or are you saying it was embezzled or mismanaged, or both? I don’t get what you are referring to. The council continues to ignore this after repeated public requests at council meetings. Ryan Cantor you obviously do not live on Wilshire….. we do, near the Wilshire Market. Getting out of our driveway is a challenge in the best of circumstances. When people were required to stop at the intersection we at least had a small window of opportunity to back out safely…now no one stops (not that cyclist ever did) Try sitting in Ford Park on a Saturday when soccer games are going on and kids are running to the WM and cars and bicycles are plowing through the intersection! Idiotic decision to place one there…..
Ryan Cantor is on the planning commission and is very close with the Meyer family. Perhaps he could get some answers as to where all the money went that should have gone into fixing our roads when his good friend Chris Meyer was in the city manager’s office for decades. Ryan never once has publicly raised this issue and for good reason. So how about it Ryan. Perhaps he could lead the charge into an outside firm conducting a forensic audit of the city’s finances and find out where at least 100 million dollars that should have gone into our city’s road repair went. I have been asking for this publicly of the council at the council meetings for a year now. Not one of our elected representatives and in this case an appointee to a comission will look into this. Joe, telling lies is bad! What part of my statement is a lie Ryan? Your first sentence contains a pretty big one. Good luck with the audit. Really Ryan! Is that your explanation as to why Fullerton has the worst roads in Orange County? All the other cities have maintained their roads. So what happened to the money we were given. That is a rational question that I’m sure everyone one in Fullerton would like to know! Fullerton’s roads are the product of lack of investment, Angie. They are indeed the worst on OC. I didn’t offer an explanation for how we got here, sorry. You must have me confused with someone else. No kidding! A lack of investment! That’s putting it mildly. So, if you’re on the planning commission is the above answer the best you’ve got? The Planning Commission deals with zoning, not budgets or roads. It would be wildly inappropriate for me to use my title to pontificate on roads, sorry. About 12 years ago the OC Register published an article about the roads in Fullerton. I was disgusted after reading that, 20 years earlier, our city leaders had made the decision to defer all street and sidewalk maintenance for 20 YEARS. This is why we will never get caught up. Could it be the 100 million was simply deferred? Of course that was a long time ago, and still the beat goes on. 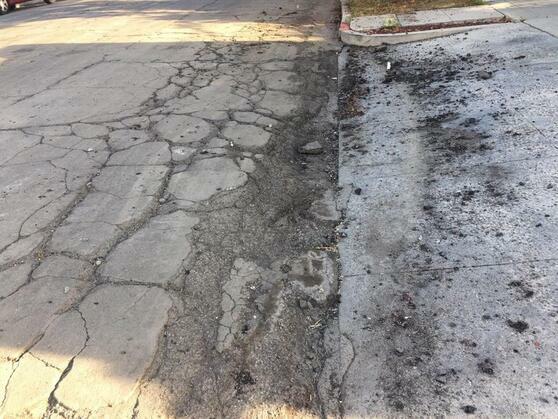 Fullerton’s current method of road maintenance is to tear the surface down to dirt. That is to completely replace. This is the most expensive method of repair. Much cheaper and less time consuming is to simply grind the surface patch holes and cracks resurface and restripe. This must be done on a regular neighborhood rotating schedule and, before you know it, everyone is happy. Yet, the beat goes on. God must love the City of Fullerton. Jane Rands …like Jesus loves a sinner. Jane Rands Doh! Did I say that? Well, somebody made some kinda mistake to get us into this heap of rubble…I mean trouble. Eileen Mele Why do you say that? Cheryl F Richardson Good one!!! This entry was posted on September 10, 2018, 7:47 am and is filed under Chris Meyer, Ryan Cantor. You can follow any responses to this entry through RSS 2.0. Both comments and pings are currently closed. Talk about unfocused. I bet half of the voices in your head couldn’t follow the point you were trying to make. Ryan looks like pee wee herman. What a turd! Ryan’s pal Vern has been arrested for DUI five times. Sean Paden is another butterfly along with Ryan Cantor. All to do over nothing. They really have it out for Joe. Every chance they get on social media, they take issue with him along with those other three creeps they are seen with at the meetings. Poor guys. Unfulfilled in so many ways. Cowards and an end in themselves is what they are. Chris Meyer looks like he is about to check out. You are absolutely correct about Ryan Cantor and the Meyers. Copying pointless discussion threads from your trolling on Nextdoor. Quality content, great original reporting. This Distict 5 election is a joke. Did you know that Ybarra is spanish for Bushala? Ybarraa looks a cross between Leiland Wilson and Shawn Nelson come to think of it. Wake up to the fact that Dougs wife is a shoe in with the vote being split 5 ways. Cantor is Meyers stooge. Nice going Joey. Glad to see Nextdoor exposed with all the bimbo douchebags and baguettes named and accounted for. You forgot just a few. It has been quiet now that you left. Pee wee is ecstatic though. Pretty sure Joe didn’t leave nextdoor, his pointless trolling just gets the boot every once in a while. Never let the turd stop you from being you Joe. You are fantastic. correction *don’t ever let the (random) turds stop you from being you.